A refugee camp in northern Cameroon hosting Nigerian refugees (file photo). Boko Haram violence in north-east Nigeria forced thousands to flee their homes, many sought refuge in neighboring countries. At least 19 people were killed when fighters with the terrorist group Boko Haram attacked the village of Malairi on Sunday, according to media reports. UN chief António Guterres is calling for those responsible for their deaths to be brought to justice. 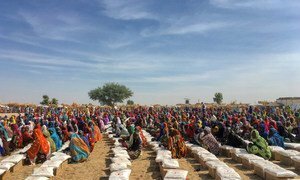 “The Secretary-General remains deeply concerned about the persisting violence in the Lake Chad Basin region,” said his spokesman, in a statement issued on Monday evening. The Lake Chad Basin region includes Cameroon, Chad and Niger, as well as Nigeria. The Boko Haram insurgency began in north-eastern Nigeria nearly a decade ago, spilling over the border to the neighbouring countries. The group’s activities, which include abductions and forcing captives to serve as suicide bombers, have displaced around 10 million people, as of 2017. The Secretary-General again called on the international community to increase support to regional efforts to fight the militants, which include the establishment of a Multinational Joint Task Force.